It is an intrepid few who will venture to take the lead and walk the talk, when the ground is yet to be laid and veritable minefields sprawl ahead. Where speech is not genuinely free, even talking the talk comes at a cost, which we must find the resourcefulness to bear. Victory in this campaign is not merely a matter of a popularity vote, but the wages of victory will include both the one vote that we have and all the popularity we can muster for our cause. “Any ‘instrumental’ calculus that focuses on the expected benefits associated with the outcome of the election, and admits that voting is at least somewhat costly, is therefore likely to show that voting is irrational. By emphasizing aspects of the act of voting, or of voting for a particular candidate or option, that do not depend on the outcome of the election, voting maybe portrayed as individually rational; and such aspects have been labeled ‘expressive’. “Expressive motivations open up a new area of study which allow rational choice techniques to be employed in ways that more accurately reflect the meaning and symbolic significance of much political behavior”. “Based on the aspirations of the expanding middle class, this party could throw away the baggage of the past by constructing an agenda suited to the circumstances of the present. As a modern, or even post-modern, party, it should be open to all, regardless of caste or religion, and promote policies that are likewise not oriented to a particular sect or ethnic group. Anticipations of such a formation are already available, in the activities of such groups as Loksatta and the Professionals Party of India, both of whom shall put up candidates in the forthcoming elections. If and when they eventually win, the victory will be owed in part to the votes cast for them conscientiously in every losing battle earlier. There is no telling when a merely ‘expressive’ vote will turn ‘instrumental’, but so that there is a chance at all of this happening, we must continue to express, conscientiously and consistently. “Racism was about as intractable a social problem as we have ever had in this country. Now, I am talking about deeply held convictions. I am sure many of you, or all of you, have seen photographs of lynchings in the first half of the 20th century, where seeming a whole town in the South, thousands of men, women, and children; lawyers, doctors, newspaper editors, church elders, even the occasional Congressman and Senator, would turn out, as though for a carnival, simply to watch some young man or woman be tortured to death and strung up on a tree or a lamp-post for all to see. And even if you have seen these pictures, realize that the pictures themselves are a poor indication of the horror of these episodes. Realize that these genteel people, otherwise quite normal, we must presume they were unfailingly religious, often took souvenirs of the bodies home to show their friends and family….teeth, ears, fingers, toes, and often displayed them in their places of business. Americans did not vote to end racism. They began to choose, first individually, then collectively, to judge themselves by the content of their character rather than the colour of their skin. They did not need to attach a badge of ‘non-racist’ to themselves to proclaim their commitment. They did not view their mission as simply legislative and did not simply call the political classes into account, but viewed it as transformative and began first of all with self-examination. Their successes which are in evidence today, are owed not just to political campaigners, but in great measure also to every lawyer who volunteered expertise in the service of justice rather than simply the letter of the prevailing law, and to every journalist who chose to voice conscientious objection rather than echoing the conventional folly of the times. The conversations they began, are in a deep sense still unfinished and still ongoing, and continue to serve us a reminder of the persistence and sensitivity that is demanded of any advocate of lasting change. “…how are we to suppress by force acts committed in the midst of our society which are regarded as crimes by the government and as daring exploits by the people? To exterminate such nations and such criminals by violence is possible, and indeed is done, but to subdue them is impossible. A means to ‘establishment of public opinion’ as a motivation of ‘expressive behavior’ could be one reason for its appeal to a rational agent. The authors of the British Journal of Political Science article make the point that it is by no means irrational to treat ourselves as our own audience of our advocacy to start with. However, our ideas will become harder and harder to ignore when we continue to express them with conviction and without compromise. The ballot may well be secret, but our participation in civic discourse outside of the polling booth need not be. 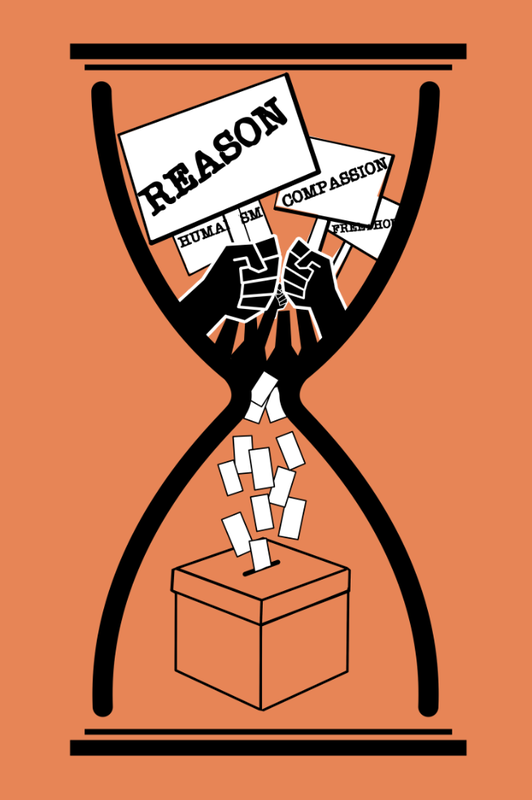 We may not yet win votes for freethought, but we seek to win voters for freethought. We seek to win over a group of thoughtful citizens, however small, who are committed to the moral progress of humanity and being the change they wish to see. It is on each one of us that this moral progress depends, and on every conversation where we will break conspiracies of silence and every conscientious objection we will raise against arguments from tradition. To begin with, we must at least talk the talk at every opportunity, at home, in travel and in the workplace, braving the raised eyebrows and bracing for the verbal brickbats. We do not yet have a bully pulpit to make our call from, but we can continue to speak up at the coffee-machine, in ticket-queues and in drawing rooms. We cannot continue indefinitely to be deterred to walk the talk simply because the ground isn’t laid yet or is strewn with mines. We must continue to lay the ground, inch by inch, through every attempt to help freethinkers organize in local communities and build mechanisms to collaborate and campaign. We must continue to be minesweepers of discrimination in any form, detecting and destroying prejudice when it is still subterranean and subliminal, so that what was once hostile territory for some, becomes common ground for us all, where we can take a stand, together, for Reason and Compassion. A Secular (“Priest-less”) Marriage Ceremony At Shimoga, Followed By A Rationalists’ Meet! Great article, Arvind. I, for one, have been doing what you have suggested in the concluding para. We should also pay attention to the psychology part of the whole thing. When you take God away from people’s lives, you create a major vacuum. What should that vacuum be filled with? That is a question to which freethinkers should pay serious attention, and come up with practical ideas which will work even in the case of the average, not-very-well-informed, person. My brother, a scientist but also a believer, tells me that no matter how brilliant my arguments, he still feels that there is some ‘higher power’ up there. Another stock reply you get is: ‘I am a spiritual person. Any problem with that?’. Personally, I never understood what this ‘spiritual’ argument is all about. Freethinkers need to go gunning after this line of reasoning also. Glad you enjoyed it, Professor. You are right in emphasizing the point that providing ‘moral support’ to those who have rejected conventional crutches, is the area we need to devote more attention towards. Here, we have had posts about seeking meaning, coping with loss and of course, Dr. Kamath’s stress-management articles. Forum threads on this topic maybe worth visiting and examining once in a while as well. The more egregious aspects of religion keep making themselves felt at regular intervals in almost all parts of Indian society. Just a day or two back the Ram bhakhts in our neighbourhood showed their bhakthi by setting of firecrackers at 2 am in the morning, with the festivities going on for nearly an hour.Some months before that, during the ganesh festival, cars were stopped and “chanda” demanded of the owners. In each case the bhakti of the believers was strong enough argument to even keep the law at bay.Had someone told me that the law enforcement people were sharing in the fruits of the bhakti, i wouldn’t have disbelieved that either. It is true that people are not amenable to reason or argument when there maybe a monetary incentive to maintain the status quo. A start can perhaps be made by beginning the conversation at least with those who share our dismay with extortionist zealots but are unable to disavow their faith altogether. Some ways to assist their thought process towards a more realistic view of the adverse impact of their benign-seeming faith is to have them consider questions like: “Is the center all that different from the ‘loony fringe’?” “Is there any such thing as a legitimate reason for religious violence?” For instance, this earlier post had a bunch of such questions for apologists of a different stripe closer home. To begin with, we must at least talk the talk at every opportunity, at home, in travel and in the workplace, braving the raised eyebrows and bracing for the verbal brickbats. We do not yet have a bully pulpit to make our call from, but we can continue to speak up at the coffee-machine, in ticket-queues and in drawing rooms. Beautifully put. I’ve made it a point to speak up against caste prejudices amongst my friends and colleagues. Now they think twice about perpetuating caste stereotypes and cached thoughts about rerservations. Thanks Satish. In the subcontinental context, speaking up against prejudice is especially urgent, with respect to religious minorities in India’s eastern and western neighbours and linguistic minorities in India’s southern neighbour, along with such prejudice in India itself as you have mentioned. The decline of racism in America ought to be viewed not simply as a distant case study, but as a mirror and a guide for citizens to examine their attitudes towards their Qadiyani/Ahmadi, Dalit-Bahujan or Tamil-speaking fellow-citizens depending on which country they live. I really liked that part too. Reminded me of the mantra “Think Global, Act Local”. Something else I think we can all do as secular humanists is: try to be good at whatever it is we do in life. Thank you for emphasizing the quest for excellence as part of the agenda, alongside the currently understandable emphasis on criticism and protest. For freethinkers to really make a point about the merits of their worldview, they should make their rationality count in tangible and demonstrable ways including professional success. Winning ‘converts’, allies and sympathizers is so often not simply a matter of ideological convictions but due to ‘force of personality’ which we can strive to build by becoming better professionals and better persons in general (for which a sound beginning seems to be, becoming persons less prone to prejudice). Here is a vivid demonstration of the try to be good at whatever it is we do in life rule. Photojournalist Sudharak Olwe explains in a 2-minute interview segment how professional excellence counters workplace prejudice. Some of his work can be viewed here . What Neil deGrasse Tyson says about the wider implications of someone from a historically marginalized community rising to the top of their profession, is illustrated compellingly in this interview with Dr. Louis Sullivan at the New York Public Library on his memoirs Breaking Ground. The interview makes instructive viewing on the topics of diversity in different professions, and on more productive ways to have difficult conversations across social and political divides. A few individuals may write articles with high intellectual contents,but may not make an impact on the intelligentia. It is the Media & the State that can change the minds of the youth in particular.Media is cynical. They only sensationalise the ‘Follies of the times’One finds that the minds of the youth is filled with what the parents have filled.Only a bold Media and the State can remove the rubbish and fill the vaccum with Sceince and Rationalism. For sake of Votes the state ,out of fear,spends a billion Rs. on a myth called “Kumbhamela” Our so called intellectuals should make it a persistant campaign to De-bunk all such myths. Only a bold Media and the State can remove the rubbish and fill the vaccum with Sceince and Rationalism. As I indicated earlier, the phrase ‘scientific temper’ that represented a Nehruvian dream and an Enlightenment ideal has now been extinguished from public discourse. As young adults in the 80s we were asked to write essays and illustrate ‘scientific temper.’ It was a cherished value of our curricula. As a result, we ended up reading and reproducing well-argued pieces by Einstein, Bertrand Russell, Oppenheimer, Haldane, J W N Sullivan, Homi Bhaba, Richard Feynman and others who were propagating the values of science. So what went wrong since then? It turns out it remained as a matter of ‘a few individuals writing articles with high intellectual content’ whose impact was limited to the ‘intelligentsia’. Since the 1980s, both the nature of the media has changed beyond recognition (with a plethora of private TV stations and of course, social networking)and so have the expectations of citizens from the State (from a paternalistic to a facilitatory role). Given this scenario, a more participative conversational approach to freethought seems called for rather than a more passive approach of groups of people crowding around radio-sets to be injected with some scientific temper. The point about a ‘persistent campaign to debunk myths’ is well-taken, but imagination regarding how these campaigns must be designed, need not be limited to the state-sponsored television ads of the 1980s and before. We see for ourselves how the bombardment of ads left hardly a dent in conformist orthodox psyches and there seems no harm at all, and in fact very good reason, to complement those ‘clarion call’ approaches with conversations that challenge orthodoxy in the here and now, at the coffee machine, in ticket queues, in drawing rooms, in highfalutin’ clubs and in marriage halls. Anonyymi kirjoitti… "Tuohon luomuun vaan ei ole oikein varaa 🙁 MielellÃ¤ni ostaisin, mutta suurin osa rahoista menee vuokraan. "Mutta sairasteluun on kummiskin varaa? Hei Linda,Jeg sliter med Ã¥ komme i gang i dag, men hos deg finner jeg inspirasjon, som vanlig 🙂 SkjÃ¸nne barn, sprekt interiÃ¸r!God helg fra Marianne M.
This is an amazing article. Thanks for the inspiring advice at the end of it. Thanks Captain. I wouldn’t call it ‘advice’ though, as it was written more as a note-to-self shared as an appeal to readers. Why we need not be daunted by comparisons with daredevil activists and how a start can indeed be made by harnessing our estimable cognitive surplus, is the topic of this thread. //Cette histoire de mÃ©decin des stars pourri jusquâ€™Ã la moelle Ã quelque chose de prf©mndÃooent pathÃ©tique. //Ou vouliez vous dire pourries? Ma seule question dans tout cela, c’est si l’Etat va rÃ©cuperer les impÃ´ts non perÃ§us, s’il meurt? sbb diorg x cantikla diorg kutuk org lain..dh xde modal, bukak la isu hijab.. padahal klu jmp cikta live, diorg yg 1st duk terhegeh2 nak amik gambar.. kgdotcom!Well-loved. I love that this purse is so functional and has a place for everythign! Â The outer pockets are perfect for your phone, your keys, you to do list and even a diaper or two! Â In fact, I think it would make a pretty perfect on the go diaper bag! Â You can read a full review of it here.